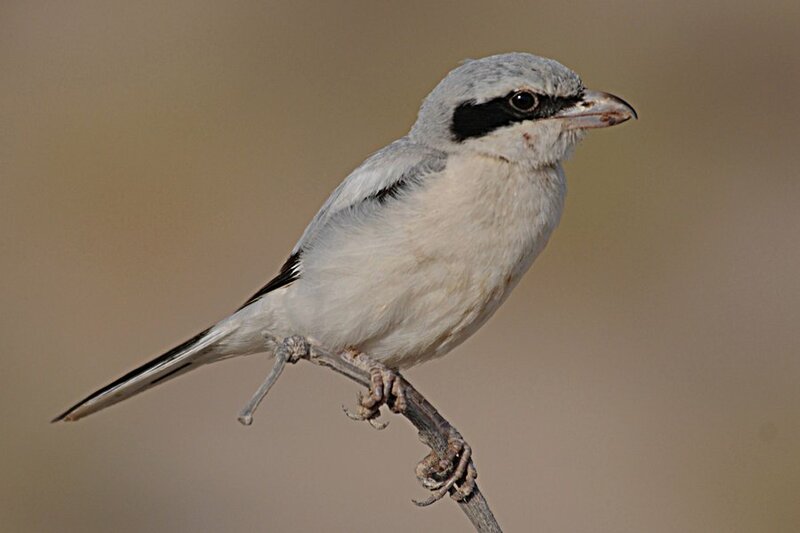 One of the great things about working a ‘patch’ is you can see birds that are common in the region but rare or uncommon on the patch, which make your day. 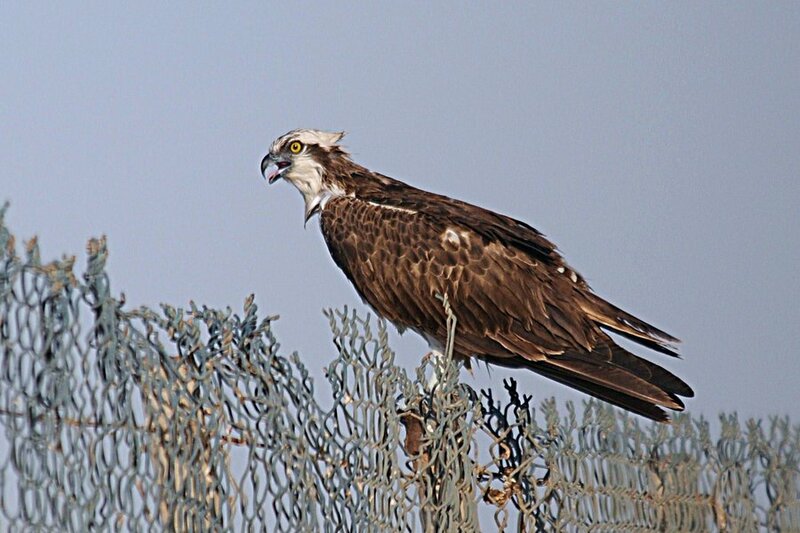 One such bird is the Western Osprey that I see every time I go to the Dammam – Al Khobar Wader Roost south and almost every time I go to Sabkhat Al Fasl, but that I have only seen four times on the patch with the first being on 5th March 2012. 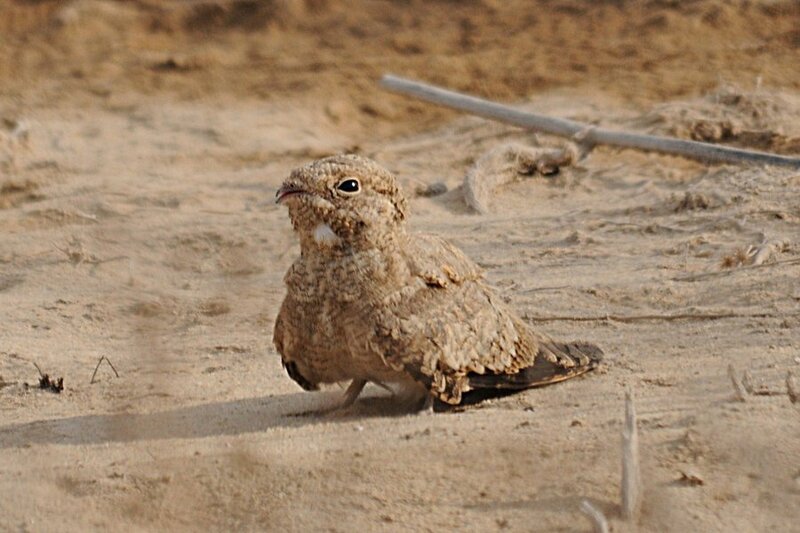 The species is a resident breeder in the Eastern Province of Saudi Arabia, where it is commonly seen but in low numbers. 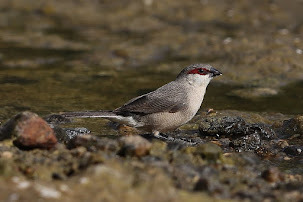 A nice, fairly confiding, bird was seen sitting on the wire fence surrounding the percolation pond and allowed me fairly close approach before flying off and attempting, but failing, to catch a fish in the pond. 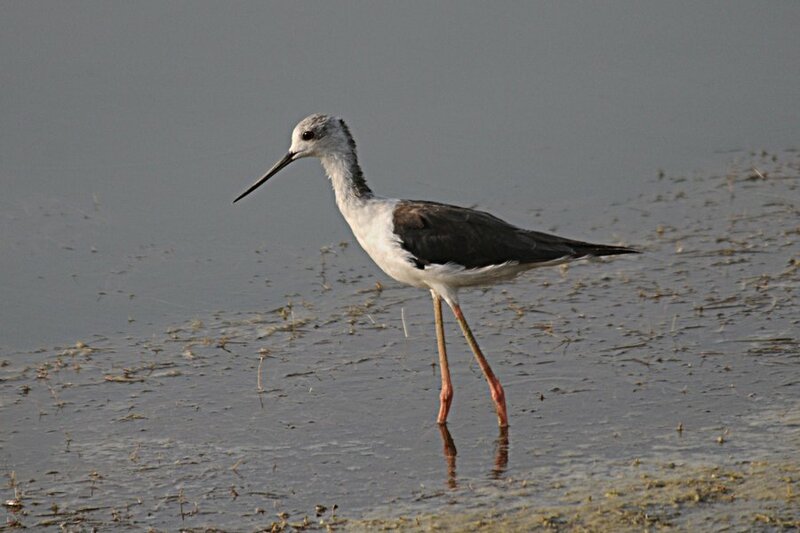 It was then mercilessly mobbed by Black-winged Stilts which drove if off from the area. 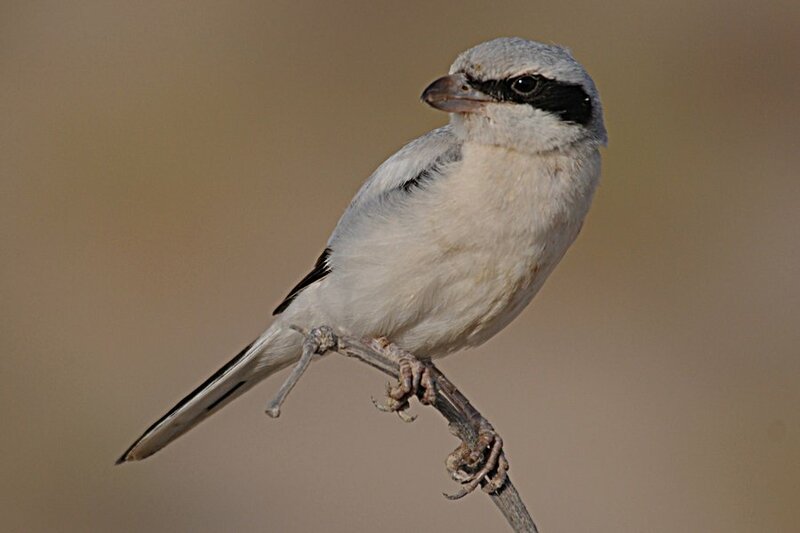 Birds like this make it worth the effort of going out every day in the middle of summer when most people do not leave their houses. 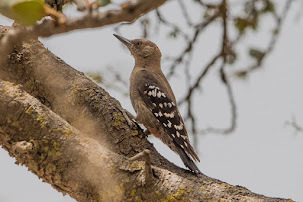 There were very few birds about apart from this with two Little Stints on the settling pond and one Blue-cheeked Bee-eater around the percolation pond being the best. 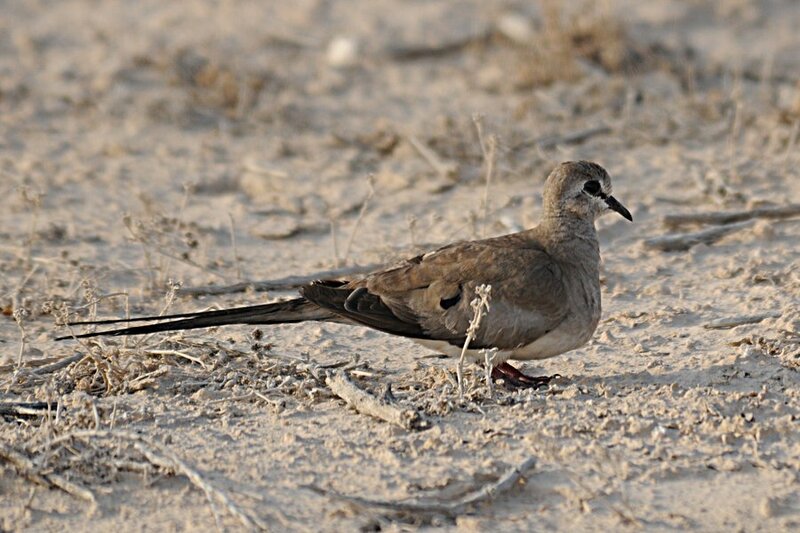 There seem to be plenty of juvenile Namaqua Doves this year compared to last year indicating they have had a better breeding season. 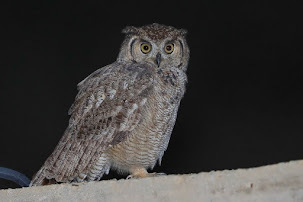 I set off on an early morning trip to Sabkhat Al Fasl and Abu Ali Island with Bob Roberts to see if we could find any Egyptian Nightjars as Bob had not seen any for many years since his last sighting in Bahrain. 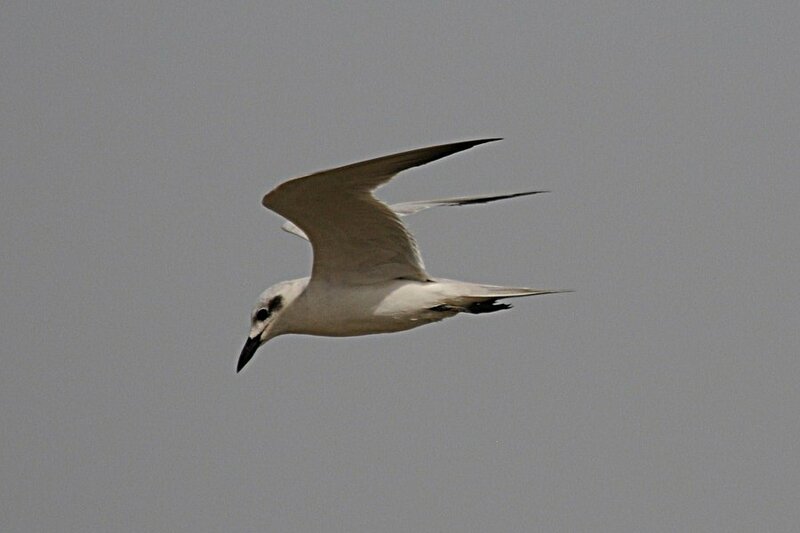 When we arrived at Sabkhat Al Fasl we saw quite a few terns gathered in one area including many White-cheeked Terns. 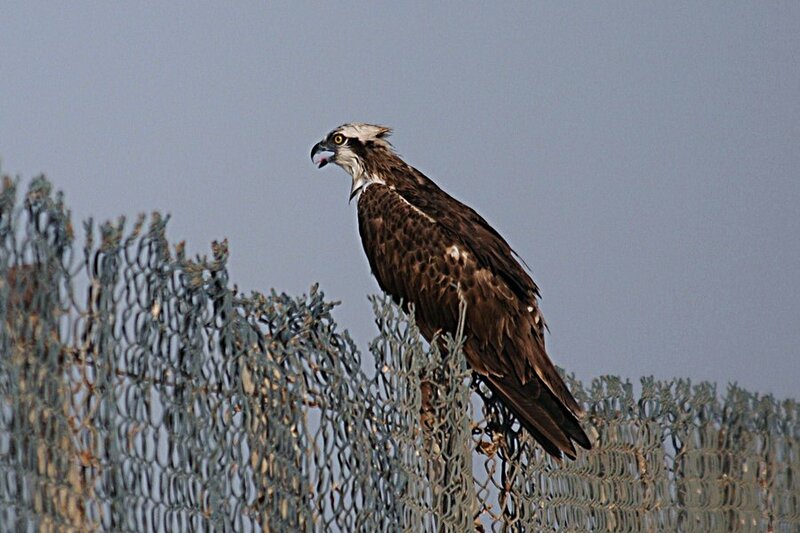 These were adults and juveniles with many of the juveniles loudly begging for food from the adult birds. 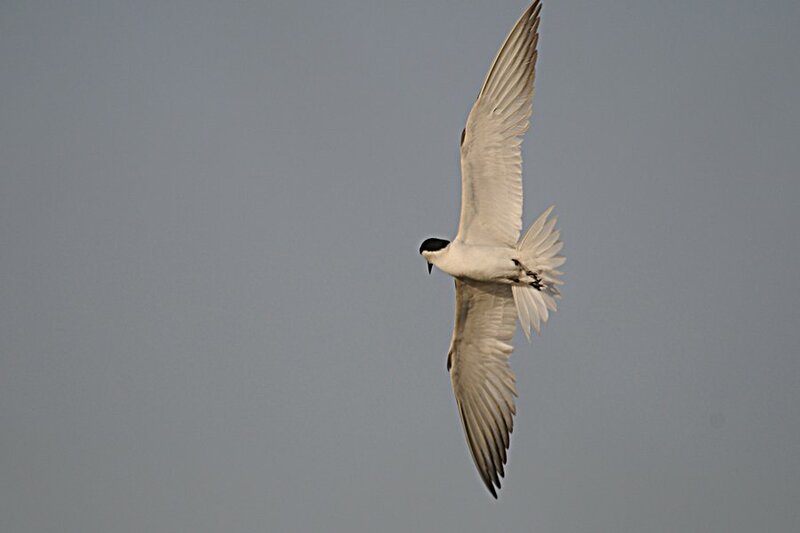 Twenty-two Caspian Terns were also present along with a single winter plumaged White-winged Tern and five Little/Saunder’s Terns. 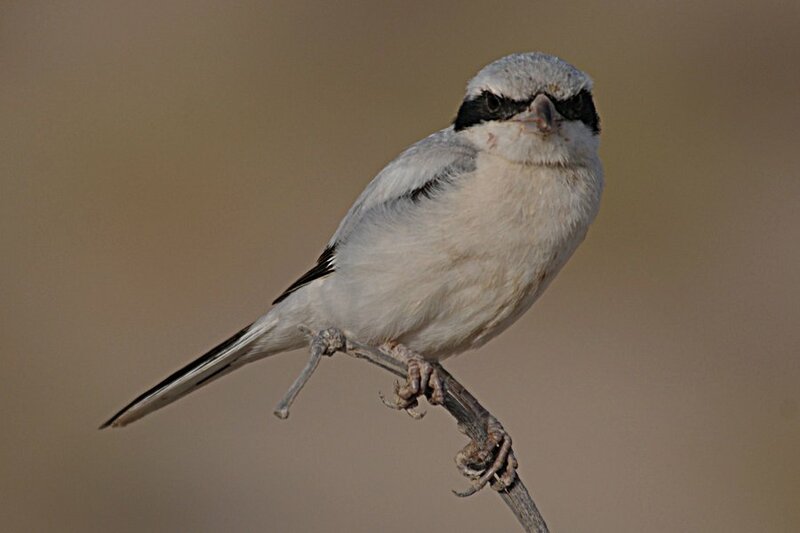 Migrants were very thin on the ground today with the only sightings being a single Barn Swallow and two Blue-cheeked Bee-eaters. 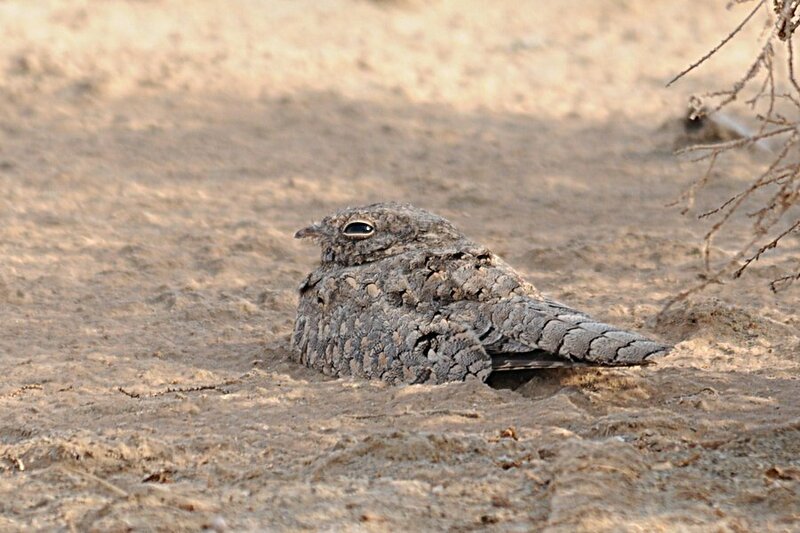 Luckily we managed to get excellent views of an Egyptian Nightjar (see previous post for photographs) in the normal place we see the species in the summer at this location as well as a second bird by the edge of the reed beds by the main sabkha area. 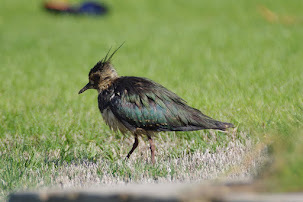 Purple Swamphens were about in good numbers and a few Clamorous Reed Warblers were busy collecting food for their young. 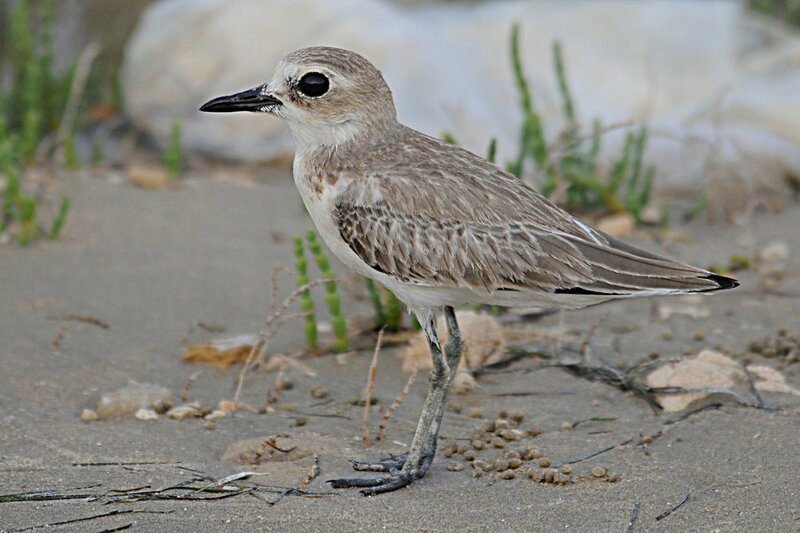 A very good record of five juvenile Eurasian Spoonbills were seen in flight over the main scrape area where two summer plumaged Grey Plovers were also seen. 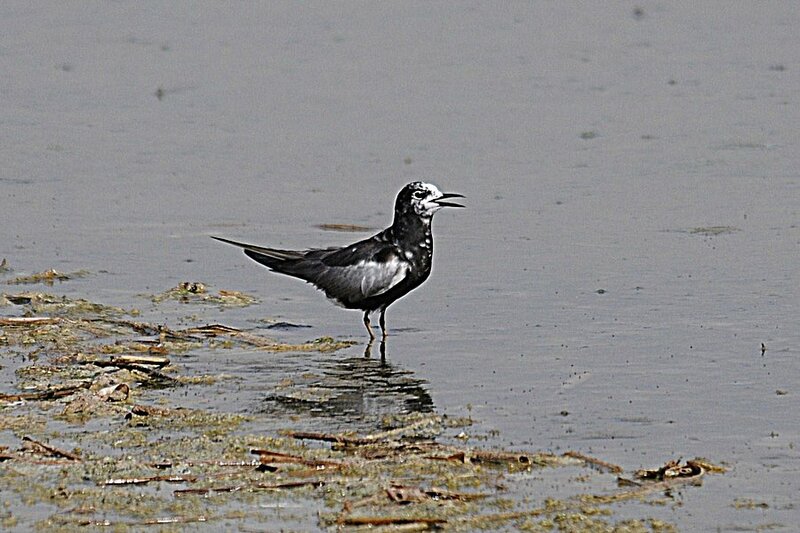 Four White-winged Terns were seen flying around here also along with three Little Ringed Plovers, three Common Sandpipers, several Little Stints and five Curlew Sandpipers. 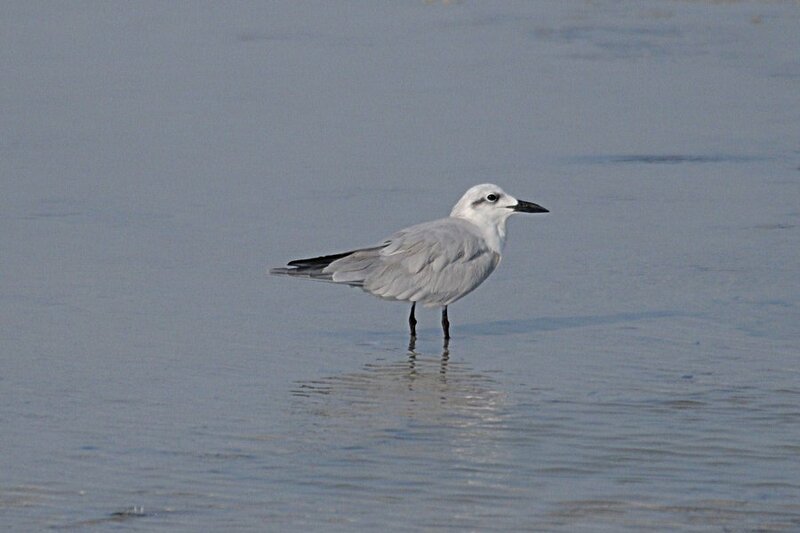 After looking at Sabkhat Al Fasl we went to Abu Ali Island and again few birds were about. 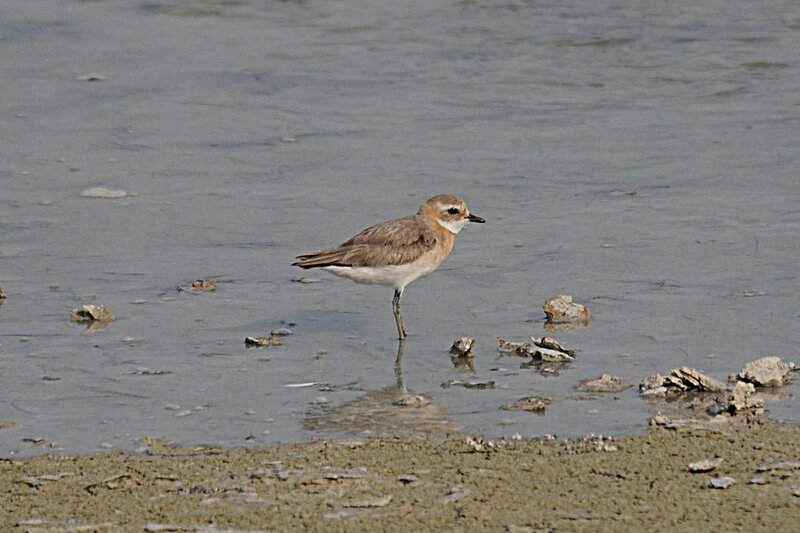 A very nice sight though were two Crab Plovers on the water edge at high tide just after the security check post leading onto the island. 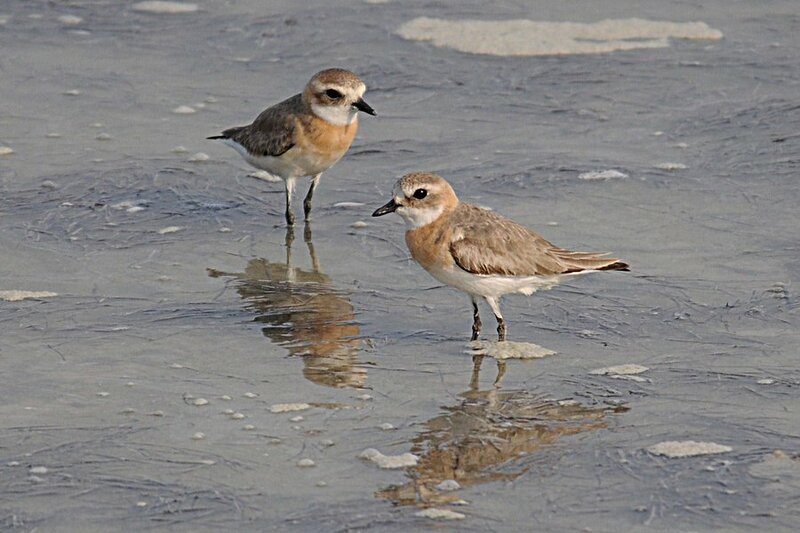 This site has has up to 120 birds present during the big oil spill of 1991 but very few have been seen here since. 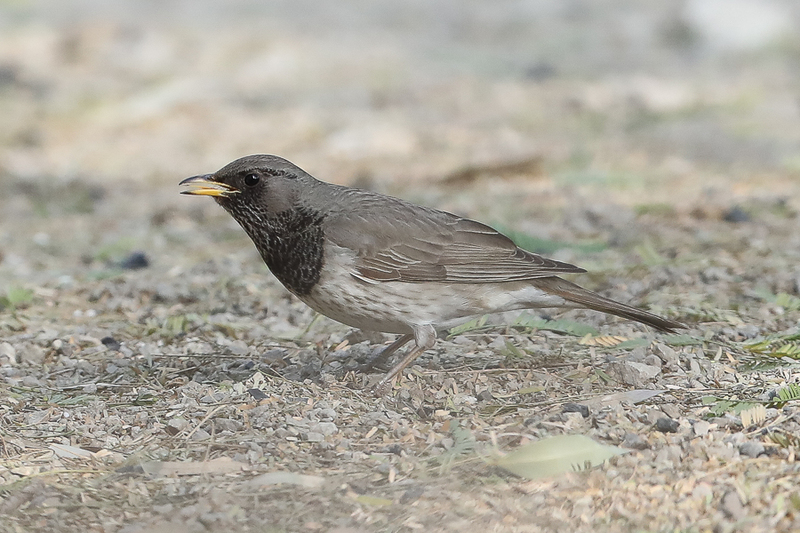 These birds were an adult with a begging juvenile, which is the first young bird I have seen this year. 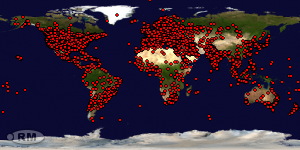 Several Whmbrel were also in the same area. 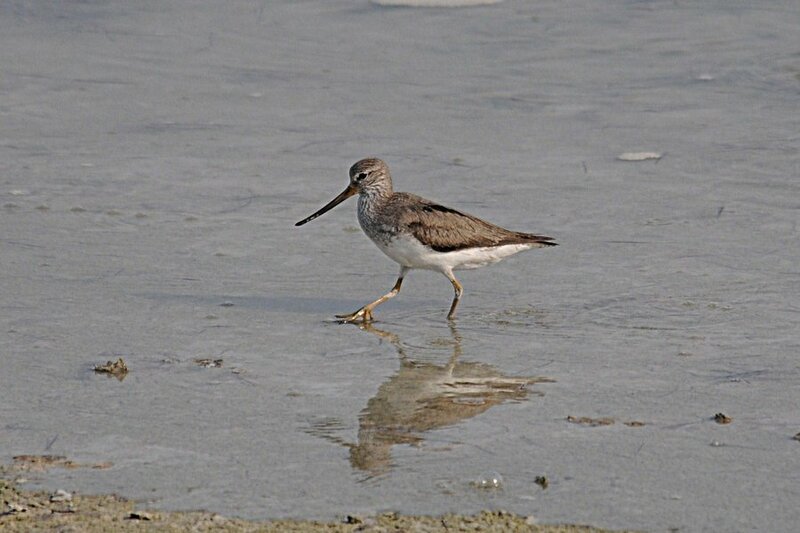 At the main lagoon there was a single Great Crested Grebe, twelve Greater Flamingos and 50+ White-cheeked Terns. 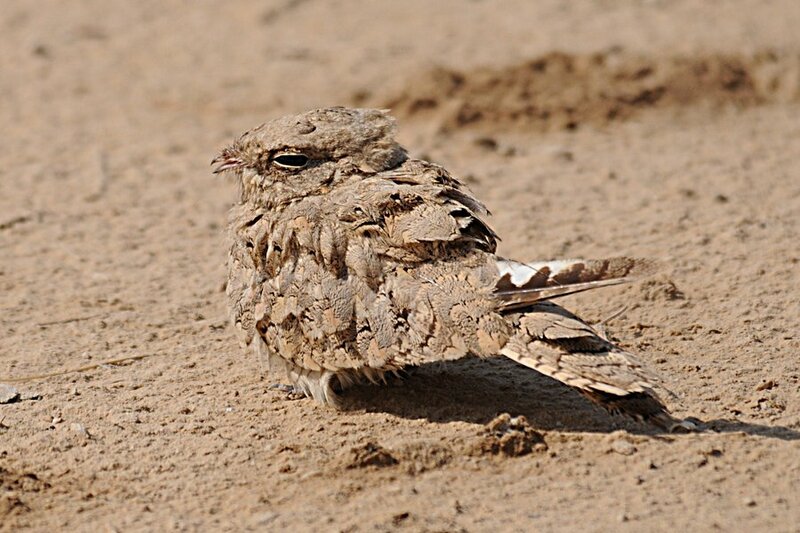 The Egyptian Nightjar Caprimulgus aegyptius is an uncommon bird in the Eastern Province of Saudi Arabia, but it is clear that the status of the species has changed in the region in the 21st Century. 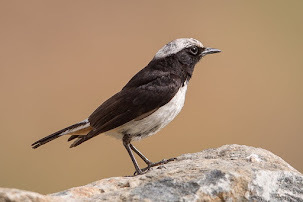 It was previously regarded as a vagrant (Bundy et al Birds of the Eastern Province of Saudi Arabia 1989) but is now known as a scarce passage migrant, summer and winter visitor. 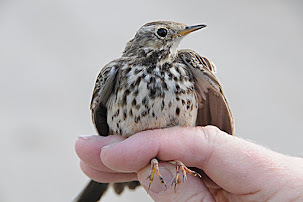 The majority of birds are no longer seen during the migration periods of early November & March to mid-May, but are now more often seen in the summer months of June, July & August and the winter period of December to March. 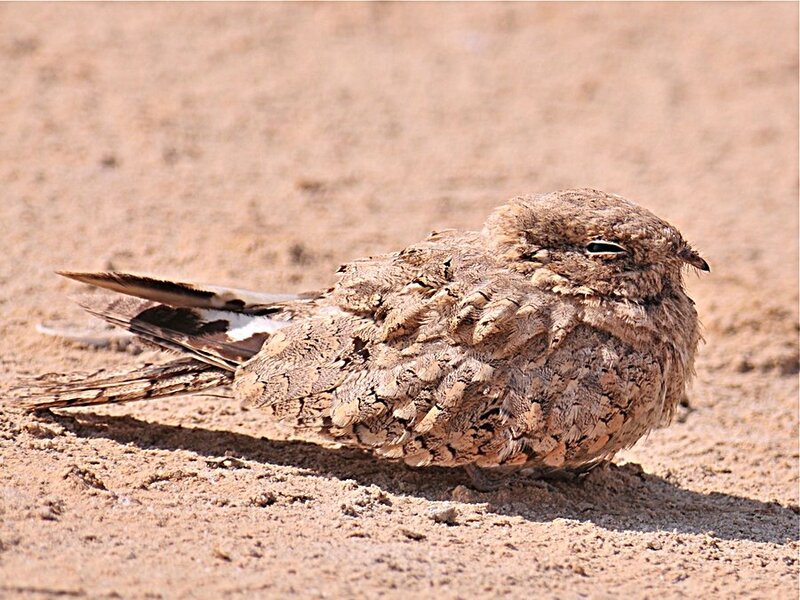 Summer records have been recorded since 2004 when a pair was discovered at Khafrah Marsh 24th June 2004 where the possibility of this nightjar being overlooked as a breeding species was briefly discussed (Meadows 2005). 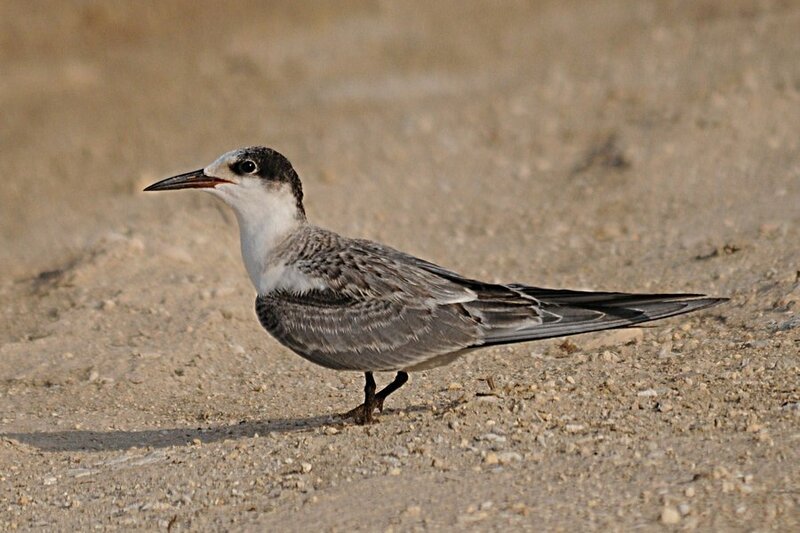 Since 2006 additional birds have been located in the region at Sabkhat Al Fasl (Jubail) in August with the highest count being ten birds together on 22 August 2008. 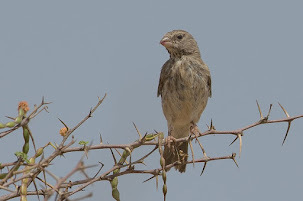 Birds have been seen every year in August at this site since 2006 with birds also seen in July in 2011 & 2012 and the earliest record 5 July 2012. 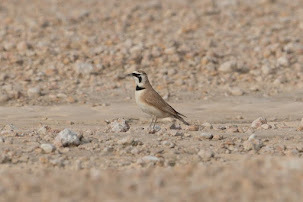 The photographs shown here are of two different birds seen at Sabkhat Al Fasl 26th July 2012. 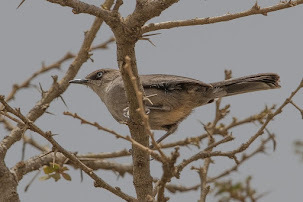 The first bird was seen in the normal area resting in the shade under a bush as they like to do. This area is a man made bank close to the water edge with small clumps of vegetation. 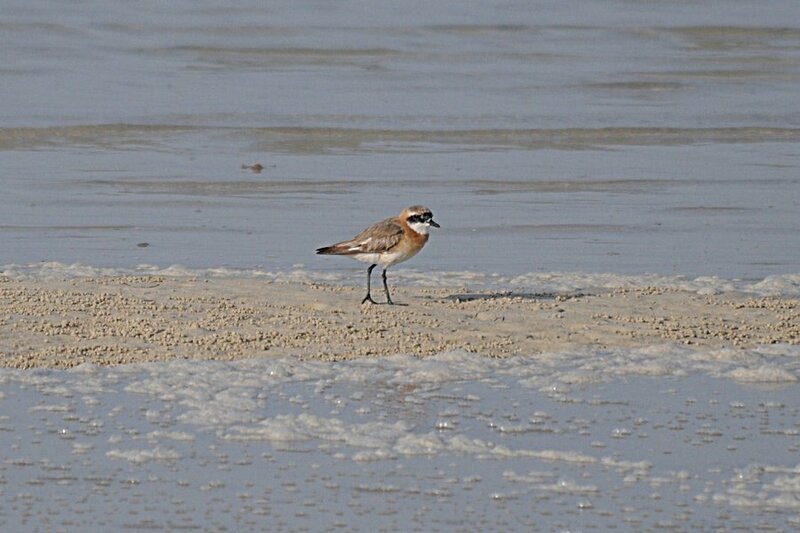 The second bird was flushed from the edge of the main sabkha area where it was seen out in the open. 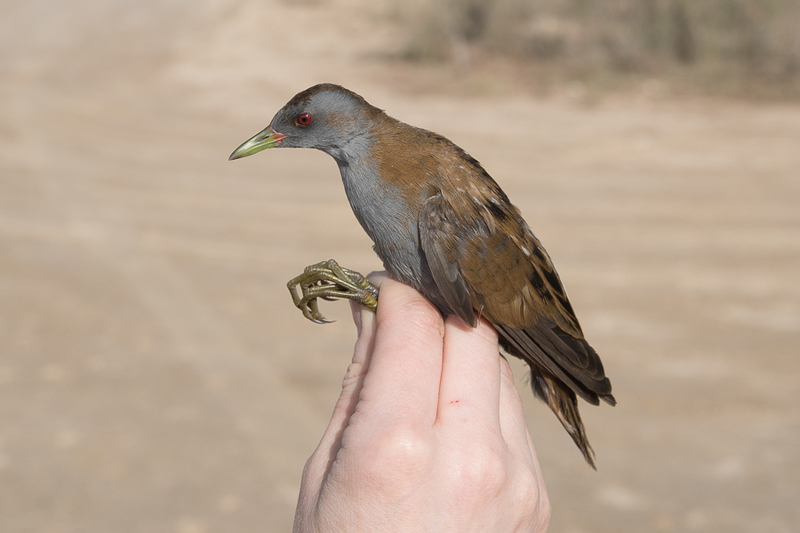 The bird was in fairly tatty condition and eventually flew off and landed in the extensive reed beds that are next to this location. 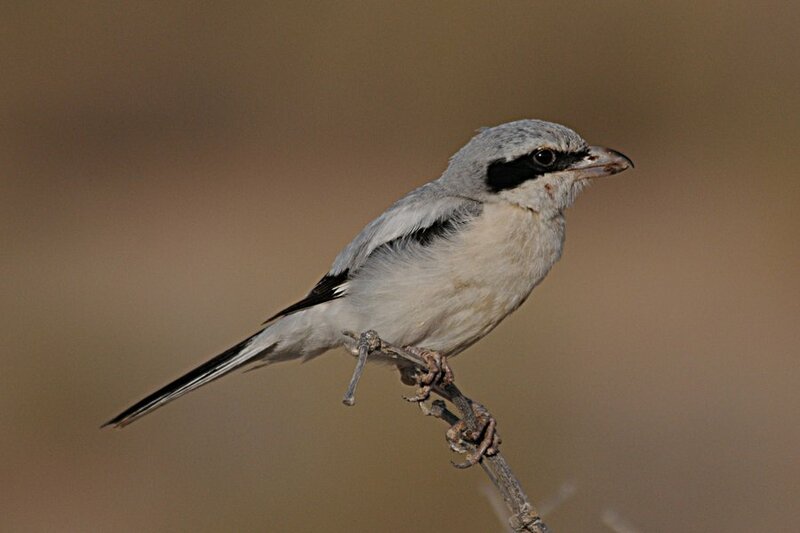 The last photograph was taken by Bob Roberts and is used with his permission. 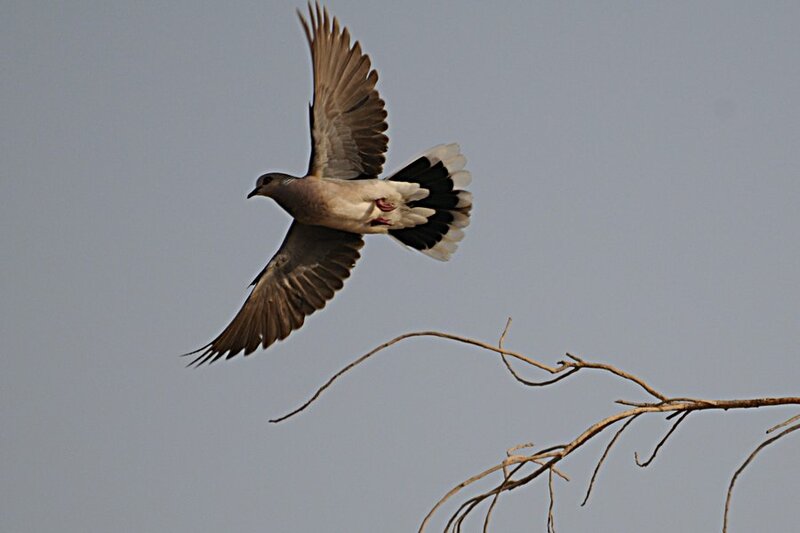 The temperatures have been very hot over the last week with daily highs of 47 degrees Celsius. 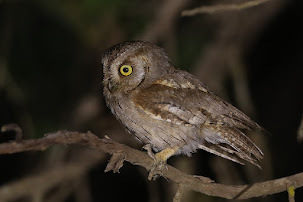 This makes birding a bit difficult as even in the early morning and late evening the temperatures are around the low 40 degree Celsius mark. Even so, I go out every day to see what I can find on my local patch and have been rewarded this month with a few good birds for the site. 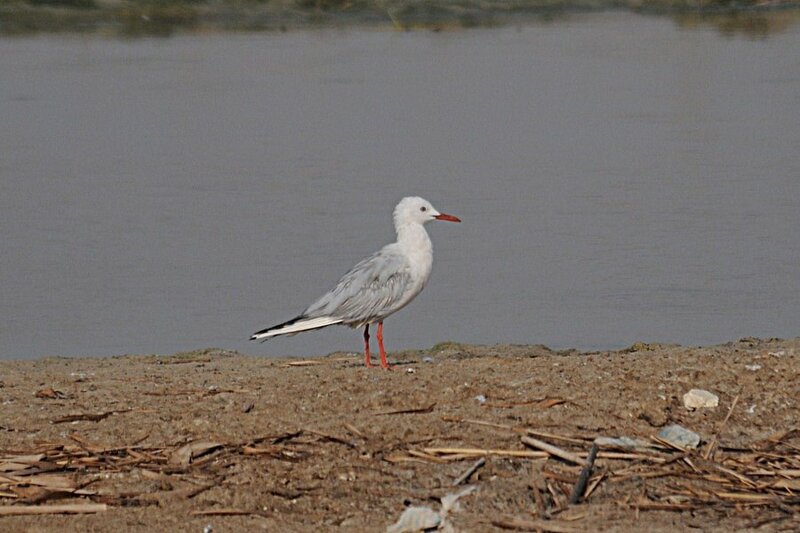 This period is the quietest month for birding in my area and also the rest of Saudi Arabia with the very few birders here birding less due to the temperatures than at other times of year. 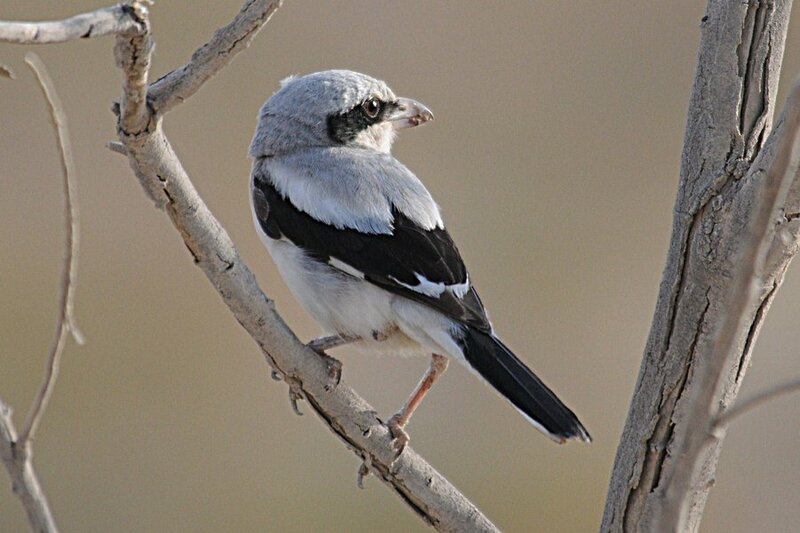 There are still good birds to be found though, so it is worth sticking it out and seeing what one can see. 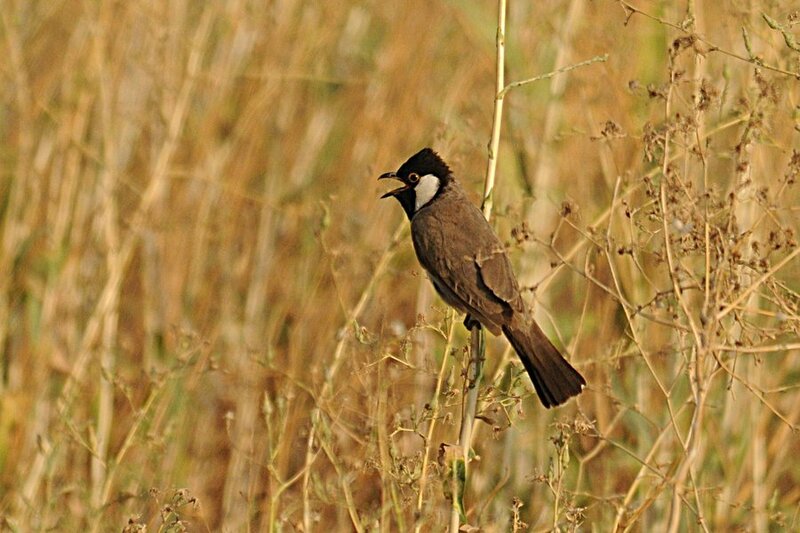 As can be seen from the two photographs below even the birds are finding the temperatures hot and many species can be seen panting to try to cool down. 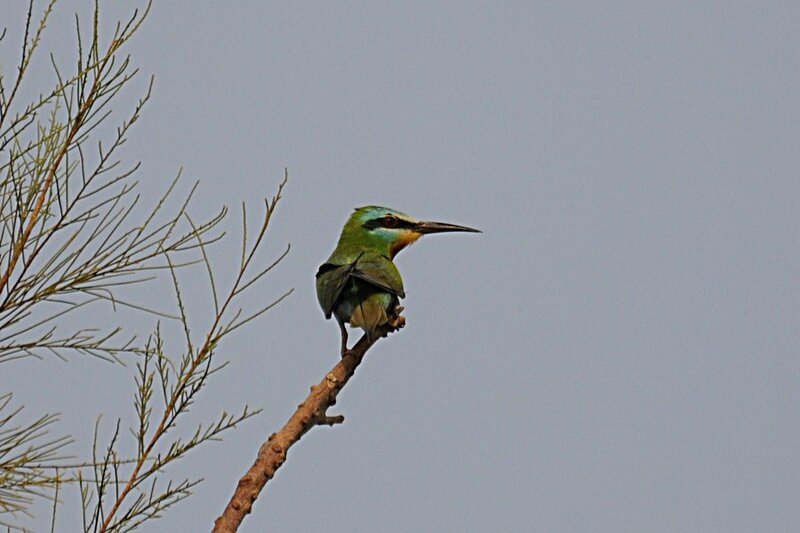 The Blue-cheeked Bee-eater is a passage migrant with this bird being a returning migrant, whereas the White-eared Bulbul & Crested Larks are resident breeders. 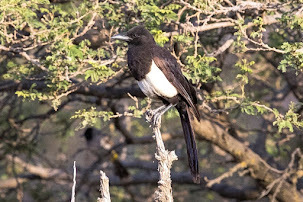 If the resident birds are panting you know the temperatures are hot, and these photographs were taken in the late evening at about 17:00 hrs when the temperatures are lower than at midday. Saudi Arabia in the summer is one of the hottest places on earth and these photos give some idea of what the conditions are like. 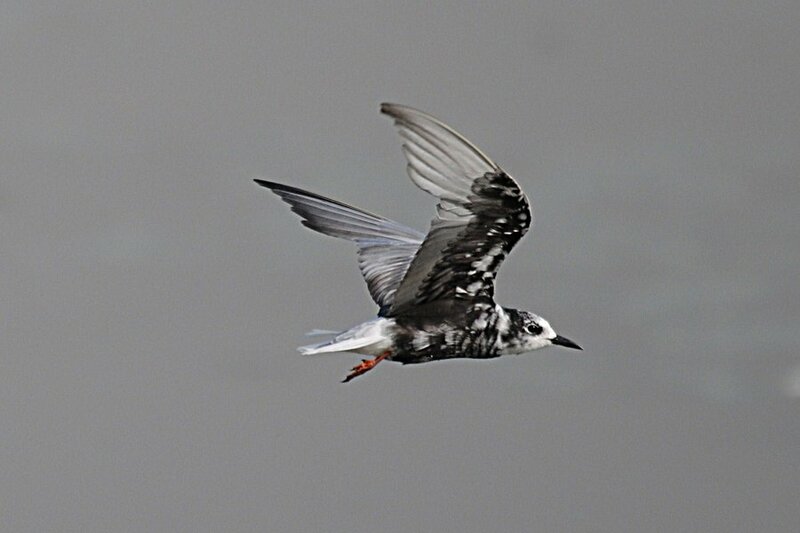 Things have been quite this week on the ‘patch’ but, hopefully, the migration season will start in true form in the next week or two? 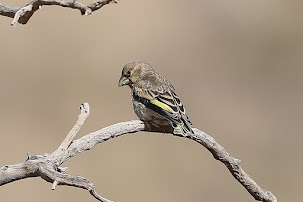 A few migrants are about with one European Bee-eater and two Blue-cheeked Bee-eaters still around with good numbers of Barn Swallows and Sand Martins. 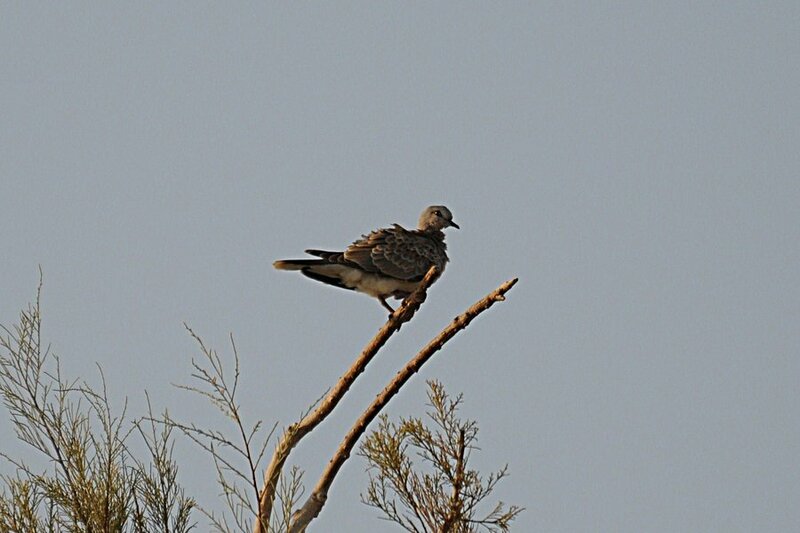 Apart from this there is little else to see apart from a few good summer visitors like European Turtle Doves with a few juvenile birds about and Rufous-tailed Scrub Robin of which there are currently two pairs carry food for their young in the scrubby areas at different sides of the percolation pond. 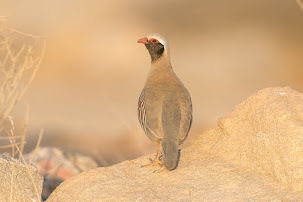 Namaqua Doves are quite common at the moment with adult birds and juveniles at various places but mainly by the side of the spray fields. 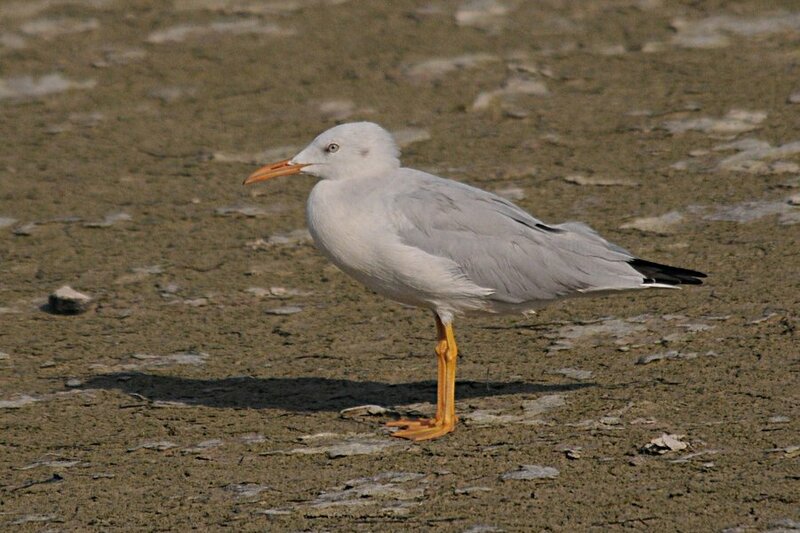 Four Little Terns are still on the percolation pond with two Gull-billed Terns, but the bird of the week was seen on 24th July and was an adult Western Great Egret. 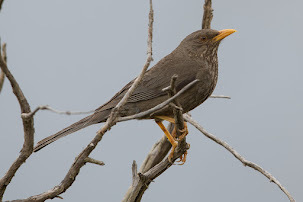 The only other birds of note being a male Little Bittern and a juvenile white phase Indian Reef Heron. 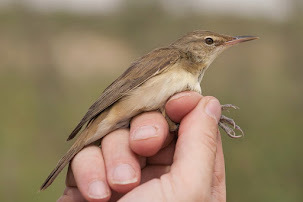 Both Clamorous Reed Warblers and Caspian Reed Warblers are still showing quite well in the reeds and surrounding scrub with the occasional one using the wire fence surround to the percolation pond as a song post. 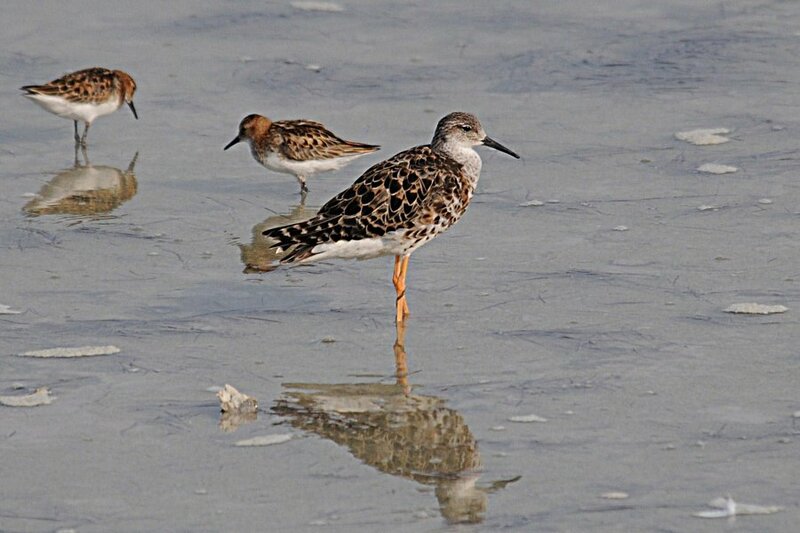 High tide at the Dammam / Al Khobar Wader Roost south is not easy to judge. 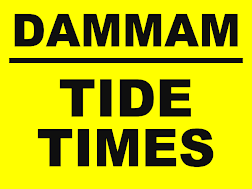 The tide times give you the timings but as the water is so shallow the wind and height of the tides have a major impact on when the tide covers the mud. 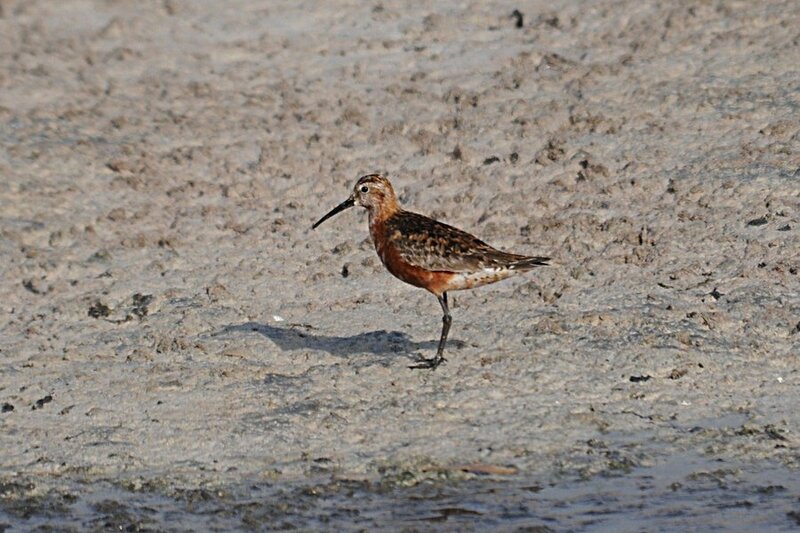 I arrived during the week almost two hours before high tide and was just in time to see the waders being pushed into shore. 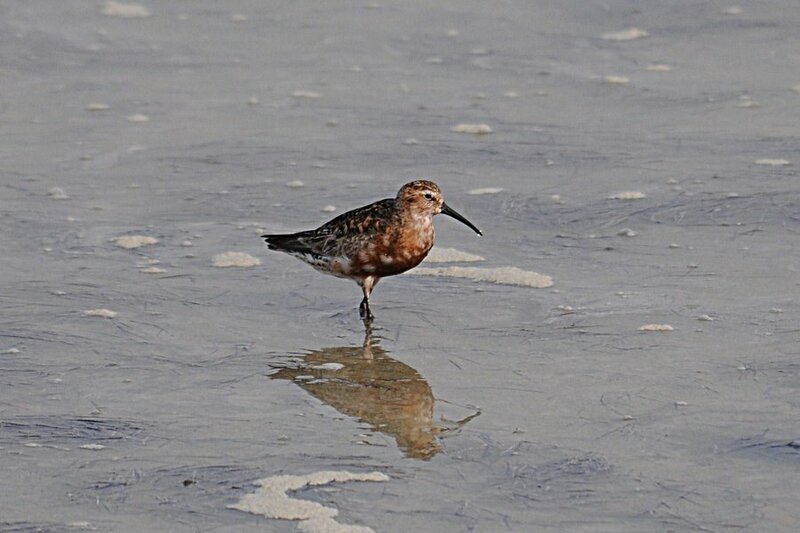 A group of really smart breeding plumage Bar-tailed Godwits was present with a single adult Crab Plover amongst them. 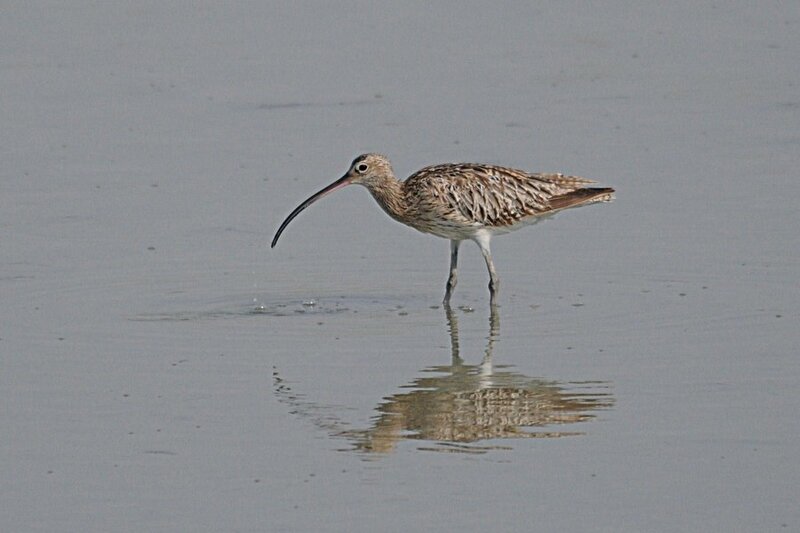 Nine Whibrel were in the flock of Eurasian Curlew and six Common Redshanks were also present. 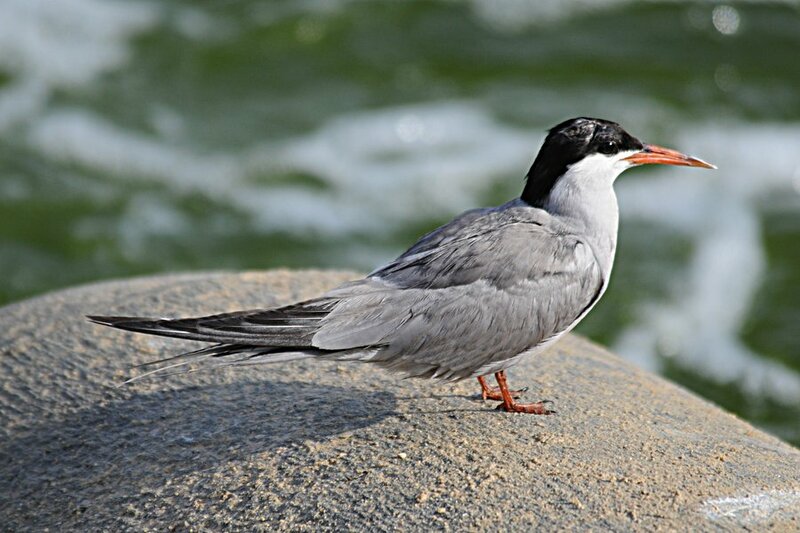 A group of three Eurasian Oystercatchers was feeding at one end with some Slender-billed Gulls and Gull-billed Terns. 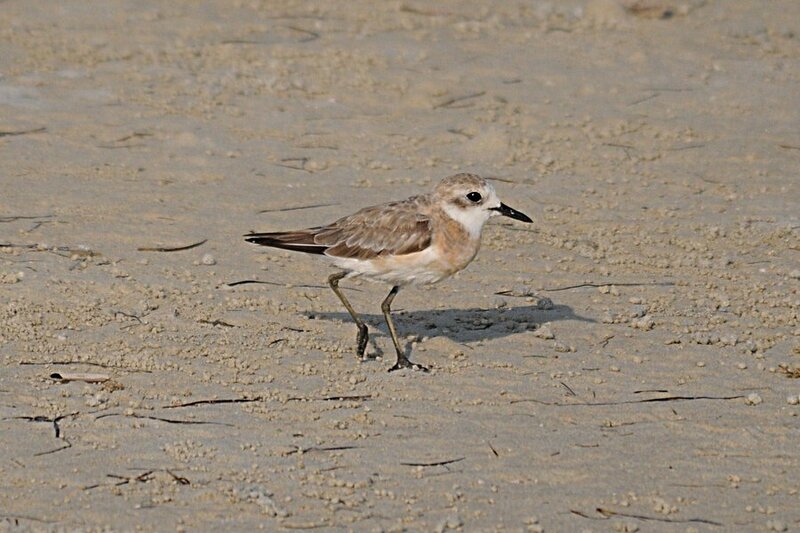 Smaller waders consisted of 12 Terek Sandpipers, one Ruddy Turnstone, seven Curlew Sandpipers 100+ Greater Sand Plovers and 25+ Lesser Sand Plovers. A single adult Greater Flamingo looked a little out of place a considerable distance from shore. 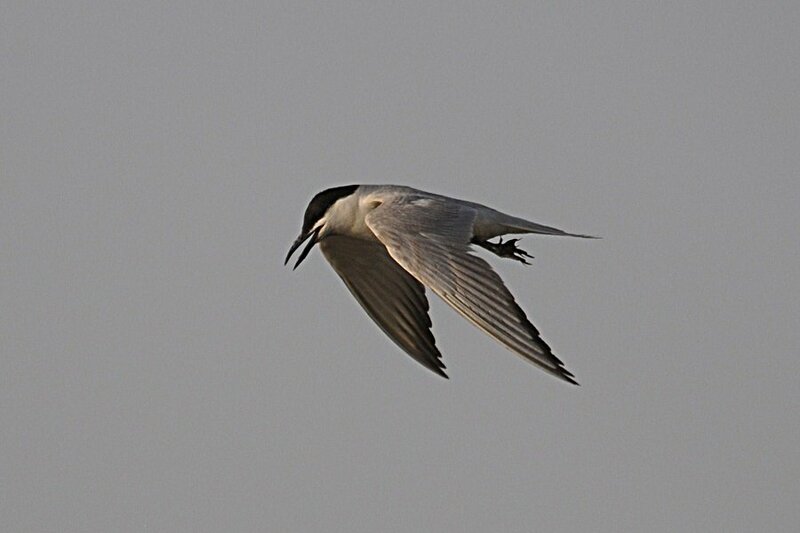 A trip to Sabkhat Al Fasl at the weekend was good for Terns. 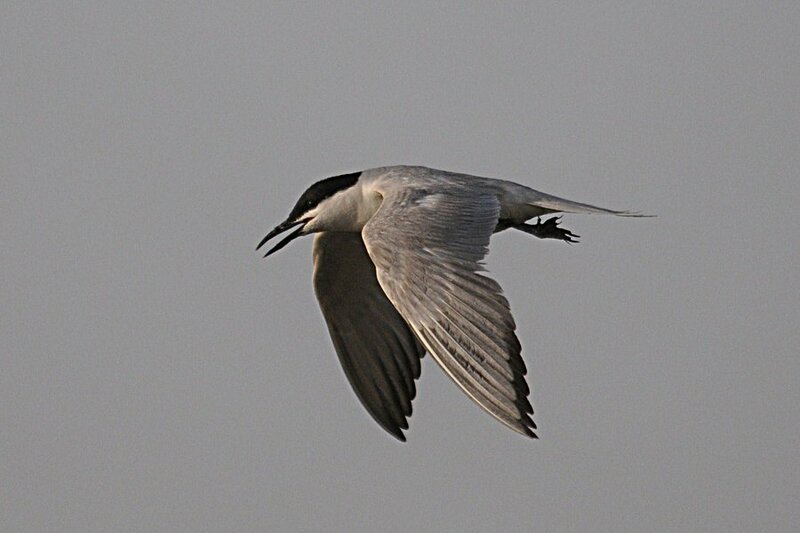 There are now plenty of White-cheeked Terns feeding almost fully grown juveniles along the main track to the water treatment plant. 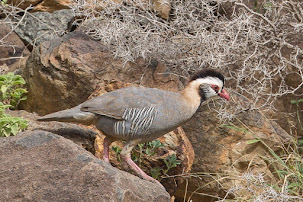 Some of these birds are beginning to look very-worn, plumage wise, but they are finding it very easy to catch fish at this site. 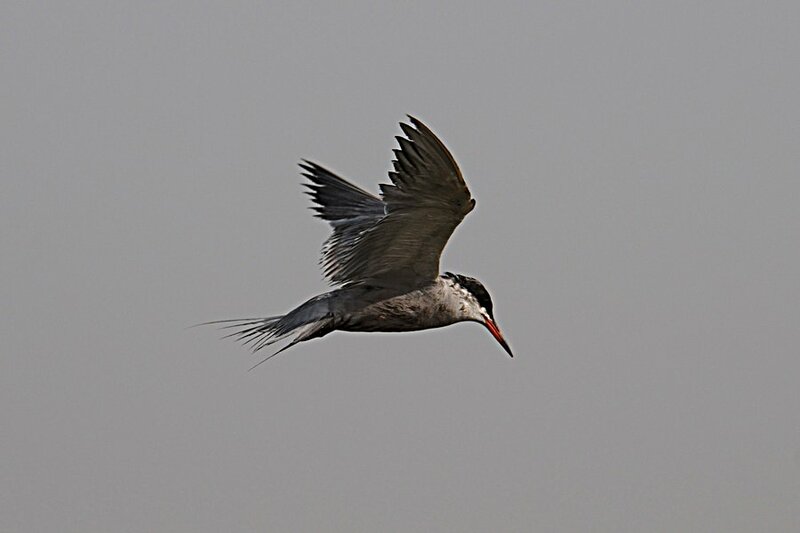 Other terns included 10+ Caspian Terns and three Gull-billed Terns as well as a small group of 25 Little/Saunder’s Terns. 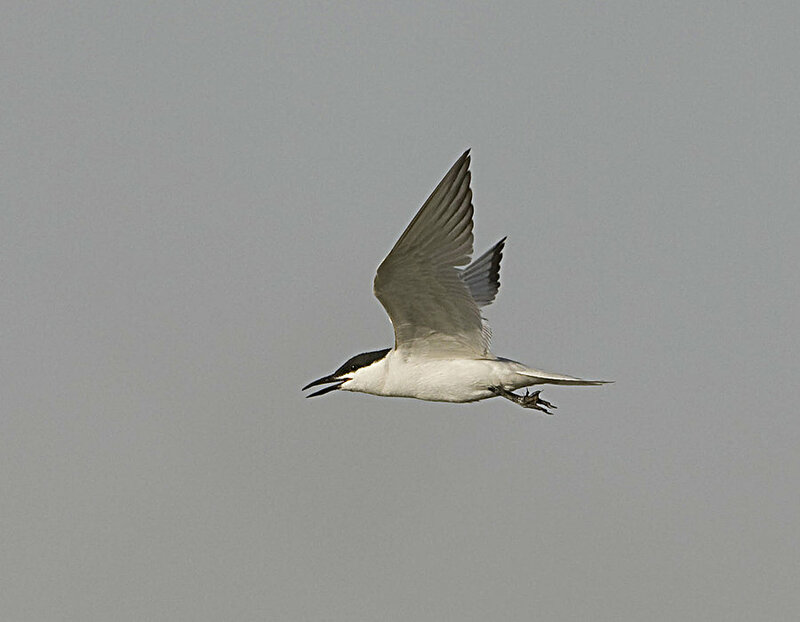 Six White-winged Terns were a nice sight with four moulting adults in almost full breeding plumage along with two adult winter plumaged birds. 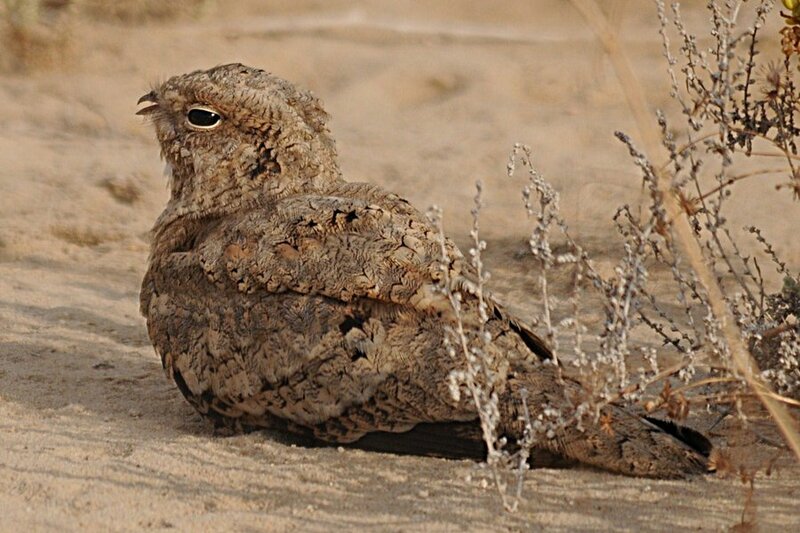 A trip to Sabkhat Al Fasl proved quite successful with the finding of another Egyptian Nightjar, this time at the other side of the site under a small Tamarisk bush on the edge of the now dry sabkha area. 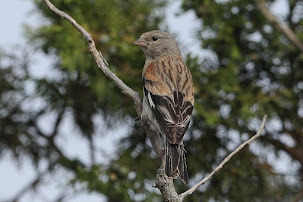 Birds are now regular here and I have seen one on the last three weekends even though it is only July. August has been the best month for the species at this site with only one July record previously last year. 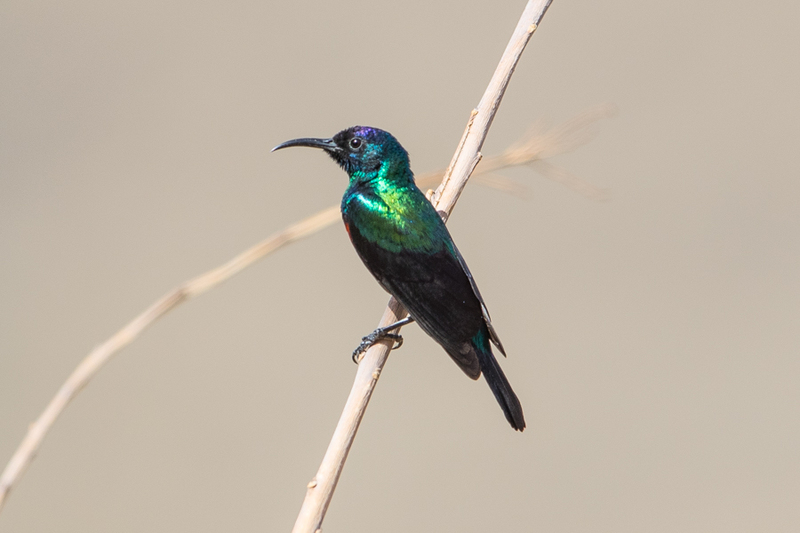 Other interesting birds included three Clamorous Reed Warblers, two Namaqua Doves, six Squacco Herons, one Little Egret, 70+ Indian Reef Herons and nine Purple Swamphens. 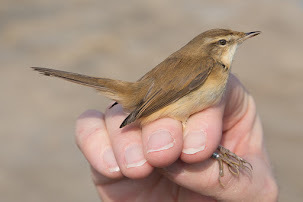 An Upcher's Warbler was my first record of this species for the site and look a little out of place in the scrub and reeds. 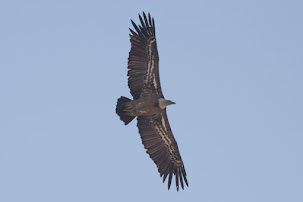 Five Purple Swamphens were also seen at Khafra Marsh on the way home, which is the new breeding site we found last year. 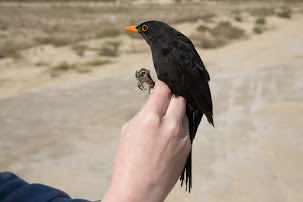 Although no young birds were seen it is obvious this site has now been colonised by the species. The first five returning Yellow Wagtails of the autumn, including one male feldegg Black-headed Wagtail, were present on the mud at the edge of the main scrape. 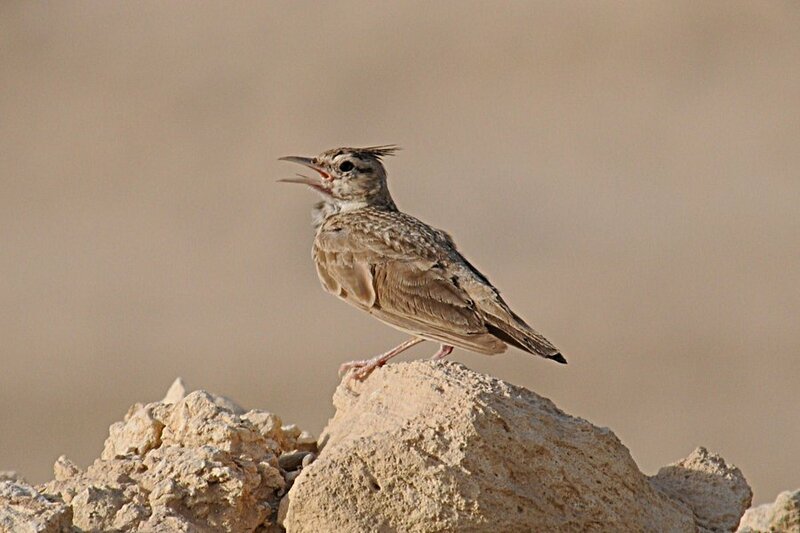 Crested Lark is a common and widespread breeding resident in the Eastern Province with good numbers breeding in the Dhahran Hills are where I carry out most of my bird-watching activities. 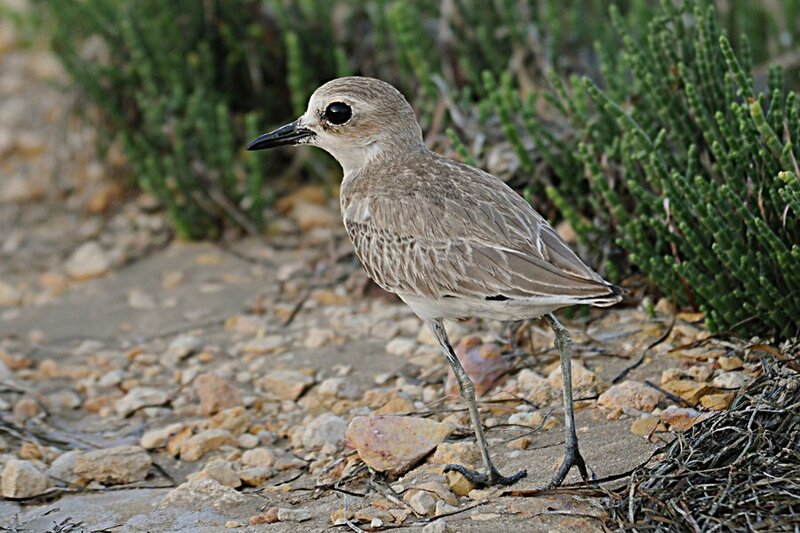 They prefer lightly vegetated semi-desert, waste ground and cultivation mainly in the coastal zone. 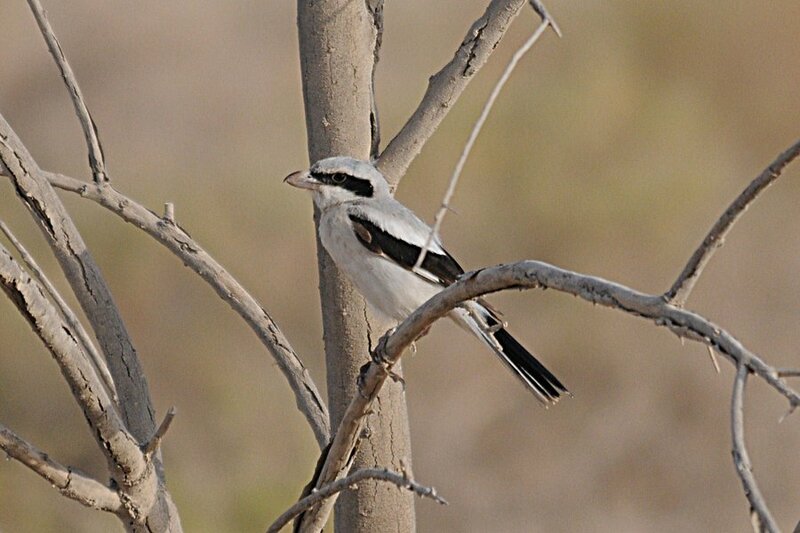 The Dhahran Hills scrubby desert has ideal conditions for the species with waste land and lightly vegetated semi-desert abounding and as a result numerous pairs of the species breed there. 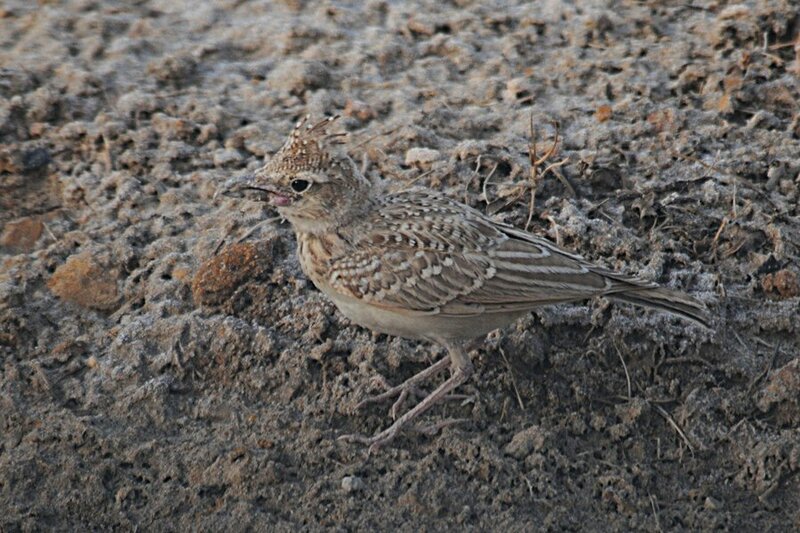 Yesterday whilst bird-watching the area I found a very young juvenile Crested Lark feeding on insects by the edge of the scrubby desert area and the bird allowed close approach. 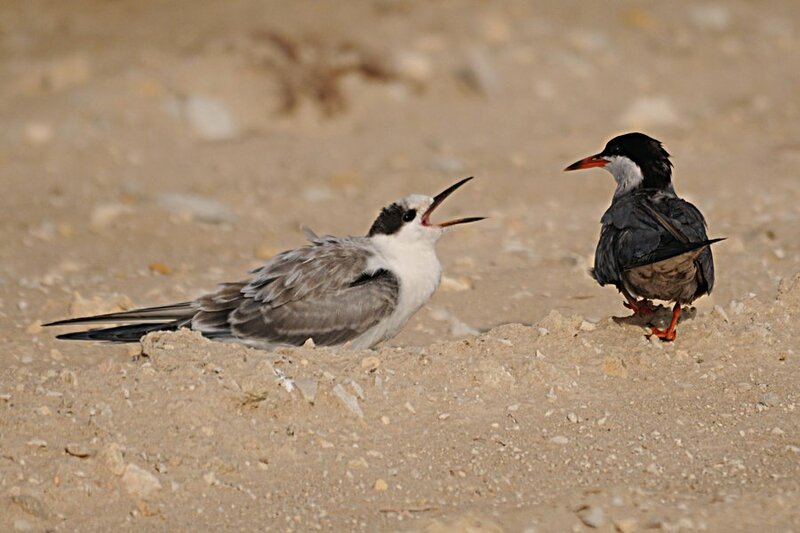 One of its parents was looking on from a nearby rock to make sure all was well with its offspring. 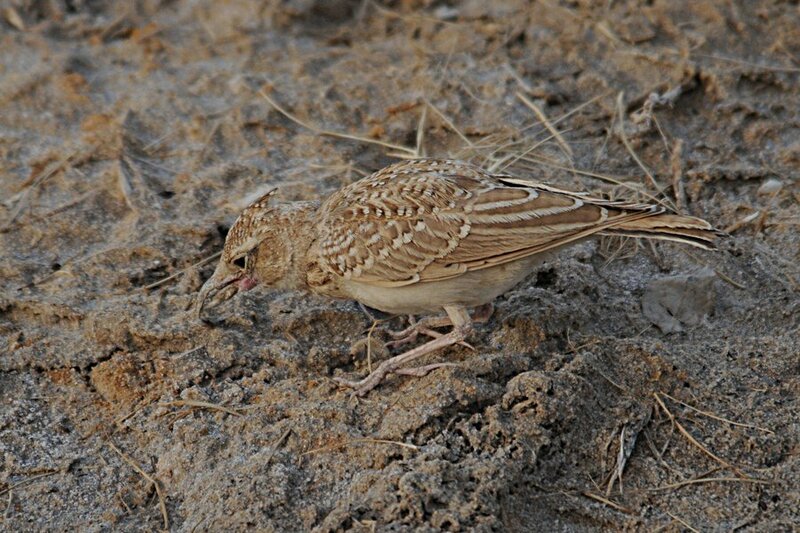 The nest is built on the ground in a depression, usually in close proximity to some sort of vegetation. 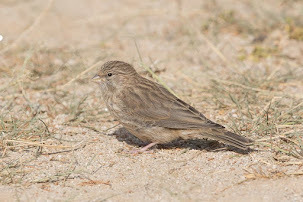 Birds presumably have more than one brood as the first juveniles are seen from April onwards and this one being the end of June suggests double brooding. 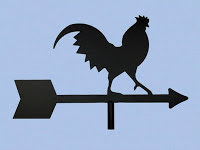 Birding the 'patch' recently has been a bit slow but there are normally one or two good birds about to keep you on your toes. Today I saw my first returning Upcher's Warblers of the autumn with two different birds seen in the trees surrounding the percolation pond. 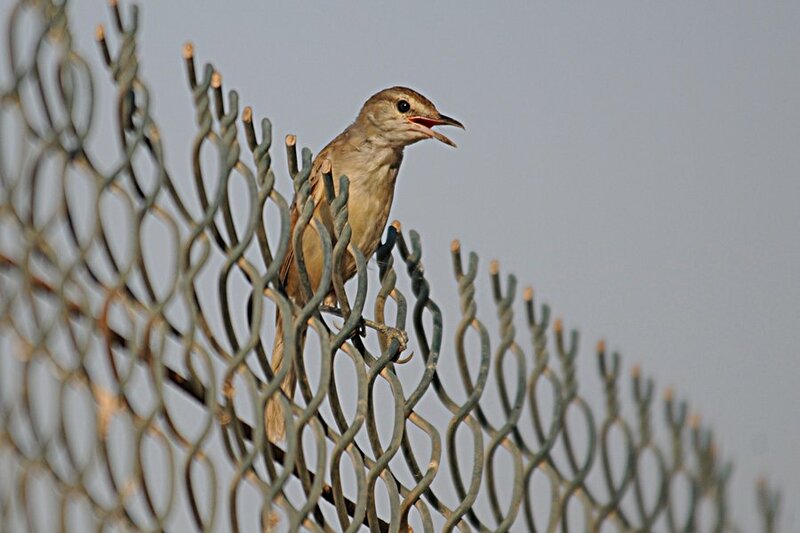 A walk through the area in the hope of locating Egyptian Nightjar did not locate any Nightjars bur turned up the Upcher's Warblers and three Caspian Reed Warblers as well as three Clamorous Reed Warblers. 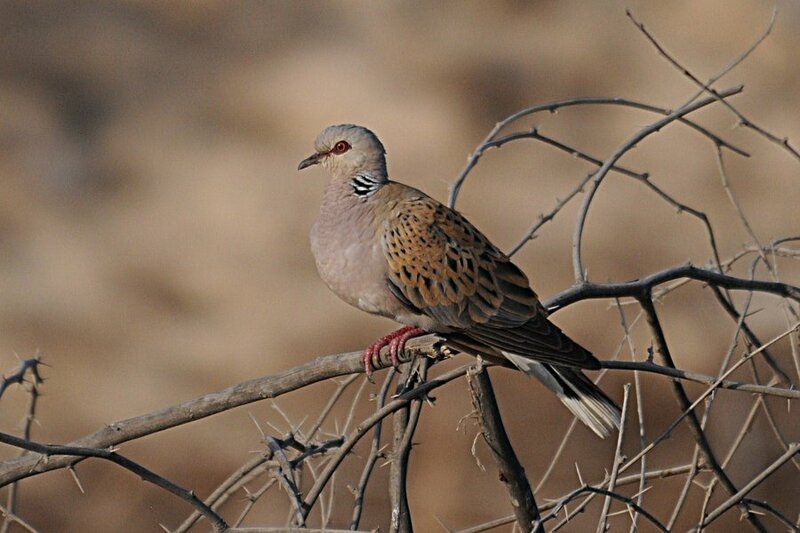 European Turtle Doves were also present with a couple of adults and a juvenile bird seen indicating the species has again bred in the area, which is very good news for this globally declining species. 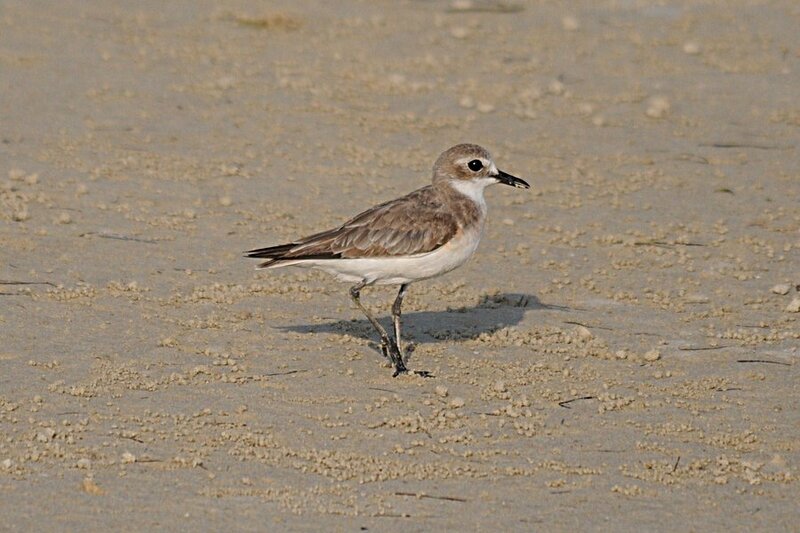 A few waders are slowly starting to appear with almost 100 Black-winged Stilts, five Kentish Plover, one Common Sandpiper and one Little Ringed Plover. The resident Grey Heron was still in place on one of the floating islands and the adult male Little Bittern was seen in flight across the pond. 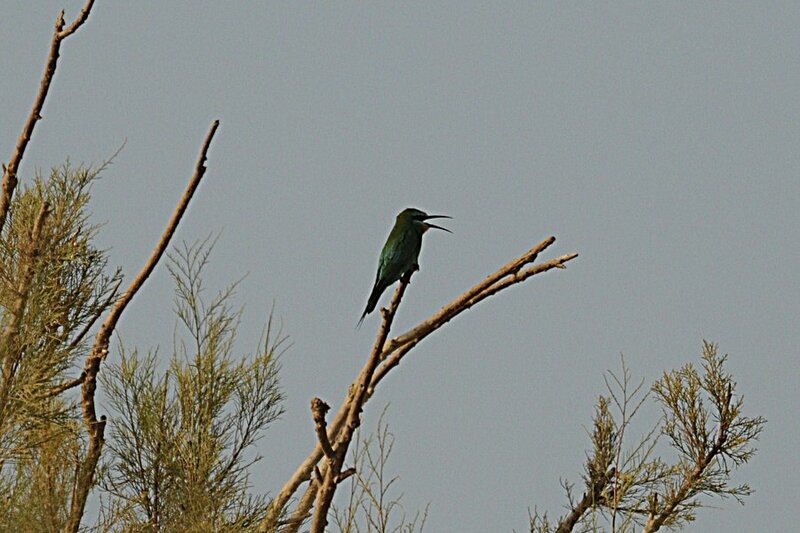 Other migrants included two Blue-cheeked Bee-eaters, 10+ Barn Swallows, 10+ Sand Martins and an early Common Swift.